Turnstone Uno Task Chair (TSUNOCHR) at Pure Design / Seating / Workspace ::: Furniture for the Home, Office, Home Office, and More at Pure Design Online! Designed by internationally-known sculptor Charles O. Perry, and renowned for its comfort, the Uno Chair from Turnstone by Steelcase is a perfect chair for work, dining, or leisure. Its back and seat are cushioned with high-density foam and upholstered in comfortable, durable fabric. To add to its comfort, the chair's seat pan is suspended within its wire frame, creating a free-floating feeling. 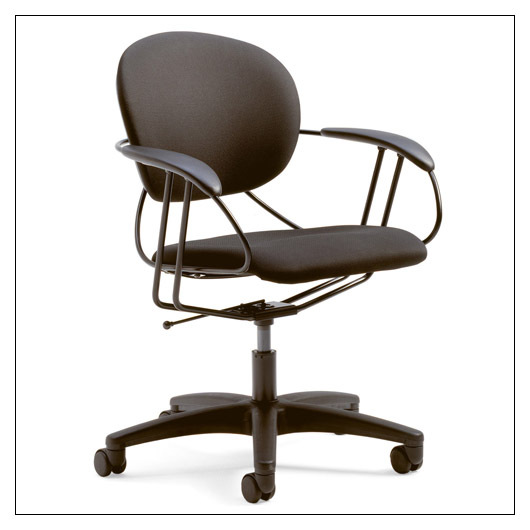 With its pneumatic lift, the Uno Chair accommodates sitters of all heights. Please allow an additional 2 weeks to ship. This item can only be shipped to street addresses in the contiguous 48 United States.